Mrs. Varsha Singhania is the Vice chairperson of the school, who has conceived the project with a goal of establishing a world class education institute. She has built a passionate team to realize her dreams and looks after the overall operations of the institution. She has dynamic and multifaceted personality which is evident from the fact that she has done diploma in interior decoration from South Delhi Polytechnic, a short course in fashion designing from NIFT, gemology and diamond grading from JDTI and course on German language from Max - Muller Bhawan. 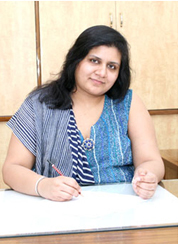 She is an alumni of Modern school Barakhamba Road New Delhi and a commerce graduate from Delhi university. Apart from this, she has shown keen interest in the upliftment of the poor by organizing various fund raising events, the proceeds of which are donated for the cause. She has also attended various workshops and seminars on child psychology and development, which exhibits her ceaseless efforts in understanding children better. She is an active member of the Round table movement which is part of Round Table International supporting education for the under privileged children in India. She has widely traveled world over and has acquired rich experience and knowledge of Art and Culture. An avid reader with a spiritual bent of mind; she is very supportive of new ideas and constantly upgrades the school through innovative techniques of teaching. She emphasizes on imparting practical knowledge to the pupil for their overall personality development.